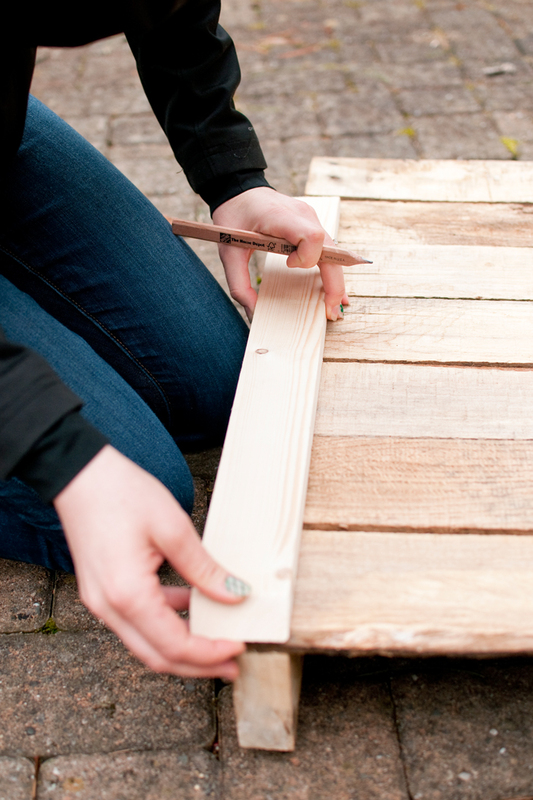 STEP ONE : If you're familiar with pallets, you'll know that the base of the pallet is made up of three parallel 2x4s that secure the pallet. The first step in building anything with pallet wood is disabling the pallet. I had two options. I could dismantle the whole pallet with a hammer and mallet. Or I could use the circular saw to remove the two end pieces and only have to dismantle the center 2x4 with the hammer and mallet. I chose the second option. Using a straight edge and pencil mark a line for where you will make your cut. Use your circular saw to cut along your marked edge. Repeat this step on the other side of the pallet. When your finished with this step you should have one remaining 2x4 in the center of the pallet. STEP TWO : This step takes the most muscle and patience. ;) Using your hammer and mallet gently pry away the remaining 2x4 from the pallet wood. This must be done gently so that you don't crack or break any of the wood. We tried lots of different techniques when removing the wood. We pried the wood away with the hammer. We used the mallet to loosen the wood and nails. We even stood on the wood and used our body weight. Any technique will work as long as your wood doesn't break. STEP THREE : Once all your wood is free you can begin building. 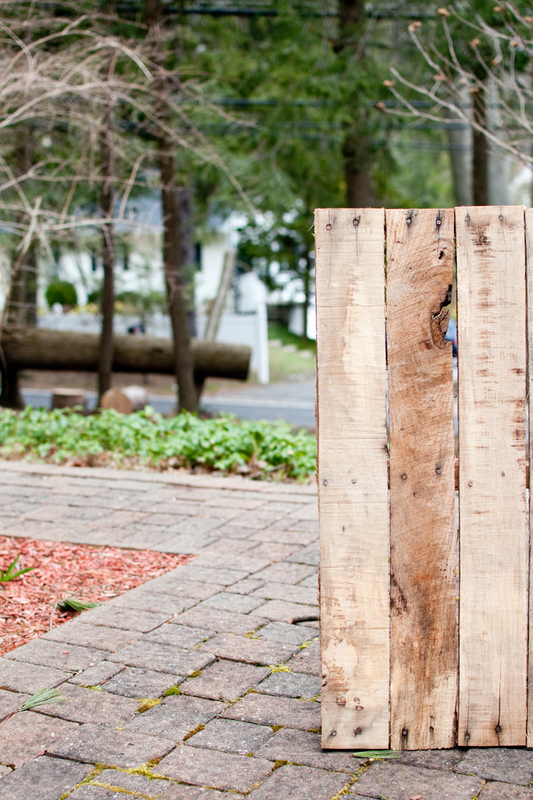 For my backdrop I decided to use the back side of the pallet wood because it was more rustic and had more character. We laid the pieces out to ensure we liked the design, then flipped the boards over. 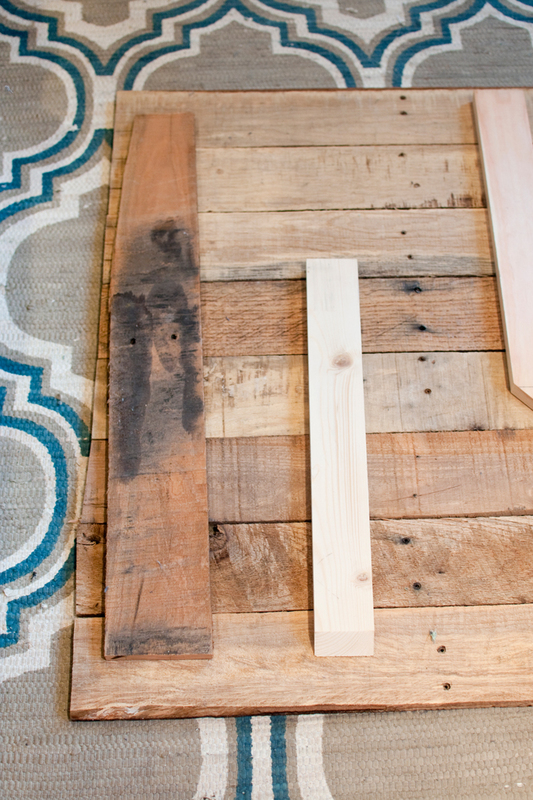 We used spare wood pieces and other pallet pieces to secure the backdrop together. Using your drill and screws attach the boards on the back. The most important part of this step is simply to make sure the boards on the back span your backdrop so each piece is secure. But back to reality, right?... Because I don't live in a farm house and I don't live on a farm. I have come to really love the look of shiplap and I have been wanting to add a few more photo backdrops to my collection. I had some left over pallet wood from the last backdrop I made and I knew the remaining pallet wood would be perfect for creating a faux shiplap photo backdrop. Table Saw *(you don't need a table saw for this project. We used it to trim some difference pieces that we used to secure the back. STEP ONE : If you're familiar with pallets, you'll know that the base of the pallet is made up of three parallel 2x4s that secure the pallet. The first step in building anything with pallet wood is disabling the pallet. I had two options. I could dismantle the whole pallet with a hammer and mallet. Or I could use the circular saw to remove the two end pieces and only have to dismantle the center 2x4 with the hammer and mallet. I chose the second option. Using a straight edge and pencil mark a line for where you will make your cut. Use your circular saw to cut along your marked edge. Repeat this step on the other side of the pallet. When you're finished with this step you should have one remaining 2x4 in the center of the pallet. *To see photos of these steps, hop over to this post. STEP THREE : Once all your wood is free you can begin building. We laid the pieces out to ensure we liked the design, then flipped the boards over. We used spare wood pieces and to secure the backdrop together. Using your drill and screws attach the boards on the back. The most important part of this step is simply to make sure the boards on the back span your backdrop so each piece is secure. STEP FOUR : Once your backdrop is built you can start the finishing touches. First you want to sand away any rough parts of your backdrop. This is pretty quick and painless. Once your backdrop has been sanded you can apply the paint. We used a paint and primer in one and it only took a few coats to get a solid white. Because there are cracks between each board, once we had applied our paint, we went through and cleaned up the edges to give it a more finished look. I wanted to share with you guys a little behind the scenes with my new shiplap photo backdrop. It's currently one of my favorite backdrops and I love that I can use it for flatlay photos as well! Welcome to the Elah Tree community! We're so glad you've joined us! Within the next 24 hours you will receive a link and password to the download library. You'll also receive an exclusive invite to The Mountsainside Gathering. Since switching to Squarespace I have become an avid Squarespace fan. However, I was on blogger for 7 years and I wouldn't ever change that. I learned so much during that time and it gave me a great opportunity to grow. Sometimes I think blogger gets a bad rap, but I still think it's a great platform. I think choosing a platform is all about your own needs. Even though I've switched to Squarespace I didn't want to leave my blogger roots behind and I'm determined to share as many blogger tips as I can. One thing that I really had to learn while using blogger was CSS and one thing that is great about blogger is that it's pretty easy to add. When I first started with blogger I thought I was stuck with whatever templates they offered. But, the template is only the foundation of what you can accomplish. With a little CSS and some attention to design detail you can make a beautiful online space. Over my 7 years on blogger I found and used lots of different CSS. Anytime I wanted to add something, change something, or take something away, I went looking for new CSS to make it happen. Below, you'll find all the CSS that was used on my blogger site. Some of the code my be old, you may already have some of the code installed, but I hope that there are some that find it extra helpful. This CSS was the very first CSS I ever installed on my blog. It removes the shadow box from images and I remember feeling like it took forever to figure this out. There are new and different ways to do this now, but this is definitely effective. This CSS was used specifically to install my blogger Navigation bar. This code was pretty difficult to figure out, so I asked a friend for help. He was able to get this installed without a hitch. When using and installing this CSS it will require some customization to your space, but it's a great foundation to get you started. Hidden Pinterest images are all the rage right now, right? The code below allows you to hide images within your post that only appear when someone goes to pin an image from your blog. This code simply needs to be added in front of your image code. I hope this was super helpful for all my blogger friends. Let me know if your run into any problems. What have been some of your favorite CSS? xoxo. Samantha.